Being a parent in a dirty public bathroom. Understanding why people go to chain semi-fast food restaurants, like "Chili's"
Not eating oreos after I've eaten dinner, second dinner, a snack, and some m&m's. stopping yourself from watching the next episode of "24"
I guess not everything that's hard is undesirable. I caught Amaya with her hands down in the toilet this evening. My first reaction: FREAK OUT. And not in the good dancing kind of way. The, "What-ARE-you-DOING?!-That-IS-SOOOO-YUCKY!-You-are-so-weird!!!!" kind of way. 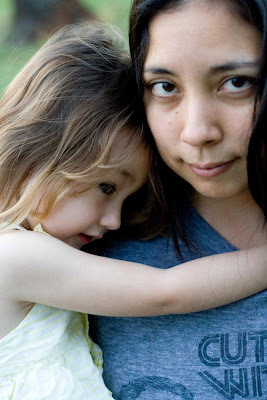 She turned her head to me, and said, "Mommy, I love you." And smiled so sweetly. My girl already knows how to work it. She doesn't know how to read letters or numbers, but she's fluent in people. I'm having a hard time with the title. I thought I would post this here, because I have some amazing students. And these amazing students actually helped me edit this poem. Usually I'm really irritated with my students (every year) because they have a hard time being critical of writing. SO, I gave them something they couldn't wait to tear apart. My own poem. I was surprised to find that they did a good job. Not because they don't write well. Because I actually made this into a way better poem because of them. It still needs some tweaking, but I like how it's turning out. They didn't like the word "crackling." But I couldn't find a suitable replacement. Poet's license I guess. Everything I came up with made it sound more and more like cereal. Your head is facing the angle of the windshield. making their paths out of the dark. Being alone, together, crackles in my ears.